EX-PAT Aussie Kenny Habul says finishing on the podium in the Liqui-Moly Bathurst 12 Hour was akin to having a ‘dream come true’ – one that started as a kid working with Aussie motor racing legend Peter Brock. The Gold Coaster moved to the United States some time ago and has since become successful in both business and racing. 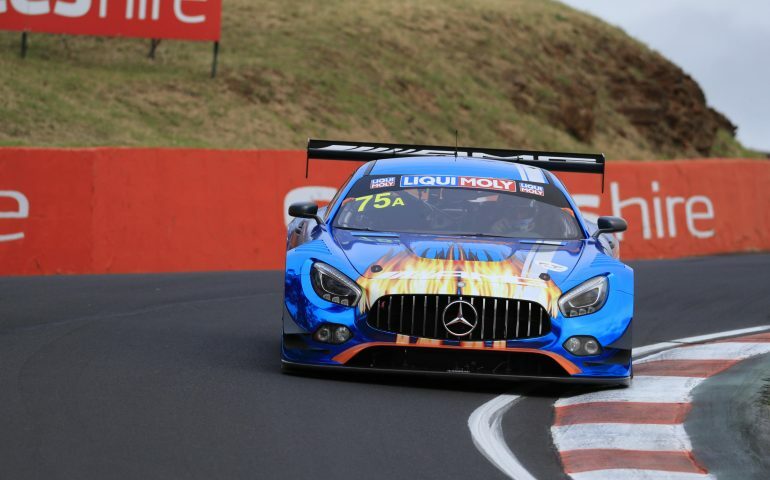 However Bathurst remained on his bucket list, meaning his second-place finish scored yesterday with co-drivers Jamie Whincup, Tristan Voutier and Raffaele Marciello was a particularly big box to tick. “(It was) Pretty close (to a dream come true) – I was having kittens there at the end, I was nervous as a butcher’s thumb, just looking at fuel and trying to understand all that engineering stuff,” Habul said post-race. “We were very close and no one really knows, we might have made it we might not no one really knows. “This is a dream for me. I left university as a kid and moved to Melbourne and worked with Peter Brock in ’92 and ’93 and my job was to sweep the floors. I learned a lot from Brock and he was very good to me. “He said, ‘No matter what you do, you come back and race here (Bathurst).’ That was a long time ago and to be here on the podium and for my four kids to watch, and I was happy. I’m not as fast as these guys but I was consistent. Habul said while his experience racing in the top series Stateside helped, getting up to speed at Mount Panorama posed another challenge all together. “You know it’s easy to get up to speed in a lot of places around the world. Tristan and I raced together in the US and other places. But this track is not something you get up to speed with in just one or two days. In practice I had nine laps, Tristan had 11 and Lello had 10 so how do you get up to speed in 10 laps around here. Meanwhile, Whincup defended his 2017 victory with second place this year – anchoring the performance of the SunEnergy1 Racing Mercedes-AMG GT3 at the end of the race when fuel saving was the number one issue. “We couldn’t be happier we felt like we certainly maximised,” he said. “I’m a firm believer that the team that does the best deserves to win. I feel bad for Chaz, he was certainly in the box seat as far as pace goes, but a big part of this race is staying out of trouble and keeping away from the traffic. These boys did a fantastic job and certainly deserve the win. We were tight on fuel as well, but hey, what’s Bathurst without a fuel race?